A day at Legoland California is the perfect adventure for children and lego enthusiasts of all ages. You will never think of legos the same way again, when you see what incredible designs can be built from these plastic lego bricks. With plenty of rides, and 3 theme parks to enjoy including the Sea Life Aquarium, and the Legoland Water Park, Lego Land San Diego offers a fun filled day for the young at heart. Legoland Roller Coasters - Try the Lego Technic roller coaster, The Dragon, or the Coastersaurus roller coaster rides. 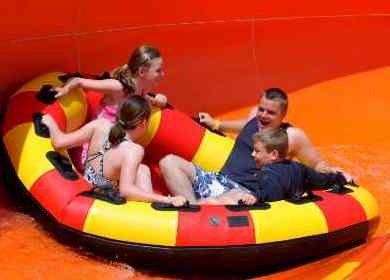 Legoland Rides include Sky Cruiser, Bionical Blaster, Royal Joust, Pirate Reef, and many more. They also offer a fun driving school for kids ages 3-5 and 6-13. Star Wars Miniland at Legoland - Enjoy this Star Wars Miniland area and scenes from the Star Wars movies and animated series, all made out of 1.5 million lego bricks. Pose with life-size models of your favorite characters, including Chewbacca, R2D2 and Darth Vader. Miniland USA includes famous sites from around the USA, including New York City and New Orleans. A favorite with kids of all ages. Don't forget your camera. 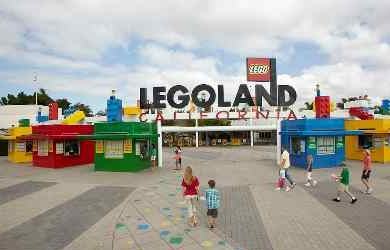 Legoland California in a fun family theme park based upon Legos, the famous plastic building bricks from Denmark. 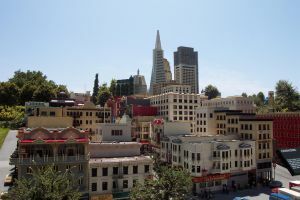 This popular park has been expanding and adding more rides, a Sea Life Aquarium, and the first Legoland Water Park. Legoland Hours: Open most days from 10 AM except for off-season it may be closed Tuesday and Wednesday, closing time varies. The Legoland Water park is open on some weekends in March and April, then daily from ~ May to labor day weekend. Be sure to check their calendar for which days open. Parking: $20 for cars, and $30 for campers and RVs. Ticket Prices: Admission prices depend on whether you visit one, two or all three parks. You can also purchase a second day on your way out for a small fee. See our Legoland Discount Tickets page for information about discount tickets. Food: Enjoy the food at the park, or nearby restaurants. Some of my favorites are Karl Strauss, a microbrewery and fun restaurant located just west of the park, or the Canyons restaurant, on the hill above the golf course just east of the park. Both are within walking distance. Nearby Attractions: Carlsbad offer many family friendly nearby attractions, including the seasonal Carlsbad Flower Fields, Tamarack Beach, and Carlsbad Premium Outlet Mall. 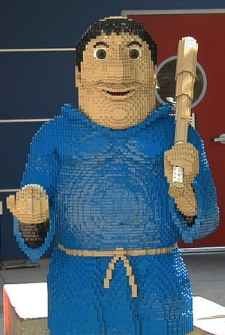 Legoland Hotels - The Legoland Hotel California, the first Legoland hotel in the US. Is located right in front of the park. Call 877.534.6526 for reservations. On the other side of the entrance is the Castle Hotel. Call 888-690-5346 for reservations. Another great hotel near Legoland is the Sheraton, about 30% cheaper, and has its own private entrance to Legoland. For reservations call 760-827-2400. Any of these choices are perfect for multi-day vacation to enjoy some down time during naps for the kids, or some fun at the pools and waterslides. For reservations call (760) 827-2400. Special package deals offer Legoland discount tickets with your hotel stay. Legoland California Resort features the world’s first and only Legoland Water Park. This new San Diego water park offers an interactive, splash-filled, and fun time for the entire family. Legoland water park hours - The water park is only accessible through Legoland, so you must have a Legoland ticket to enter. It is typically open from 10 AM to 6 or 7 PM during the summer, and 12 - 5 during spring and fall weekends. The family raft slide is just one of seven slides to be featured at Lego land Water Park and is 11-feet wide and more than 300-feet long. The 5.5 acre Legoland Waterpark is designed for families with young kids and features several water slides including the family raft slide, enclosed tube slides and toddler slides, a zoo-themed water play area for toddlers and an interactive water play zone. 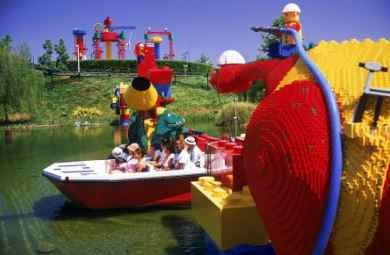 On the Build-A-Raft River, kids can customize their own raft made of soft Lego bricks before floating down a lazy river. More than 20 new Lego models will splash and spray water on guests throughout the Water Park. Kids can get their own drivers license and drive at Legoland but we recommend that adults drive to this theme park. Directions to Legoland Carlsbad Cal from San Diego coastal areas: From Interstate 5, exit Cannon Road east in Carlsbad, turn right at Legoland Drive and follow the signs to the Legoland entrance. Directions from San Diego North County Inland: Take 15 North or South to 78 West to Interstate 5 South, then take Cannon Road East, turn right at Legoland Drive and follow the signs to the Legoland entrance. Directions to Legoland California from Los Angeles and Orange County: Take the 405 South / Interstate 5 South to Cannon Road East, turn right at Lego land Drive and follow the signs to the Legoland entrance. Click on the link above to open the Google Map for Legoland California and other attractions in San Diego and southern California.